LTi's expertise lies in providing responsive, cost-effective solutions for complex logistics issues. We take pride in our ability to provide our customers with products and services which not only meet their varied requirements, but provide solutions with the streamlining, reliability and performance enhancements that cut operating costs. 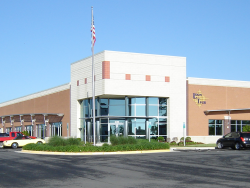 Logis-Tech, inc. (LTi) was founded in 1987 and is located in Manassas, VA, with field locations capable of serving all 50 U.S. States and select international locations. Logis-Tech has current operations in 45 States and fifteen overseas locations. We continue to expand our field operations and services support capabilities to commercial and government customers worldwide. Logis-Tech,inc. is guided by honesty and integrity in dealing with its employees, customers and partners in order to achieve long-term success in the government and commercial marketplaces. Logis-Tech,inc. is a growth oriented company serving government and commercial customers by providing the ‘best value’ solutions to information technology, dehumidification, logistics and maintenance solutions, as well as, a complete line of professional services. Based upon a strong backbone of honesty, integrity, loyalty, ethics and professionalism, Logis-Tech, inc. hires and retains exceptionally qualified and highly motivated employees who are in the business of making our customer’s successful by exceeding their stated requirements. Our employees are the strength of Logis-Tech. We seek business partnerships and supplier relationships only with other companies that share our core values. Customer satisfaction is our goal. Our expertise lies in providing robust, cost-effective solutions for your complex humidity control issues using our patented humidity control processes and materials known collectively as ESS® (Environment Stabilization Systems). Logis-Tech represents and can select from many dehumidifier manufacturers and environmental controls companies. This allows us to integrate the best in breed and value solutions for your issues and concerns. When there is no solution, we develop one either in-house or through our decades old strategic industry partnerships. Each system will be designed and engineered to control humidity and/or temperature to meet the unique needs of each application. Logis-Tech, inc (LTi) provides solutions to your problems! Our Logistics Services Support organization provides multi-disciplined capability and expertise to DOD, other government agencies and commercial activities worldwide. We provide in-depth analysis of business processes and system review to recommend the proper implementation of logistic solutions for you to increase profitability and efficiency . Our experienced staff of logisticians and information technology experts provide cost effective integrated technology solutions that make sense. We are committed to providing premier service to our corporate clients as well as the casual home user. We believe strongly in pro-active management, as it is far less costly to prevent issues than to repair them. Logis-Tech believes in the power of small business and offer our extensive expertise and experience in support.